38mm stainless steel case with 5N 18K red gold and 72 round diamonds - 0.58 ct, 8.75mm thick, transparent back with glare proof sapphire crystal, stainless steel bezel, sapphire crystal crystal with anti-reflective treatment, black dial with hourly nautical pennants transferred on the flange, minute-circle indexes transferred on the flange, inscribed admiral's cup transferred on the dial, 5N red gold-coated corum logo applied on the dial, caliber co 082 automatic movement with hours, minutes, date, approximately 42 hours of power reserve, black satin strap, triple folding clasp buckle. Water resistant to 5 atm. 38mm stainless steel case with 5N 18K red gold and 72 round diamonds - 0.58 ct, 8.75mm thick, transparent back with glare proof sapphire crystal, stainless steel bezel, sapphire crystal crystal with anti-reflective treatment, grey dial with hourly nautical pennants transferred on the flange, minute-circle indexes transferred on the flange, inscribed admiral's cup transferred on the dial, 5N red gold-coated corum logo applied on the dial, caliber co 082 automatic movement with hours, minutes, date, approximately 42 hours of power reserve, stainless steel bracelet with 5N 18K red gold, triple folding clasp buckle. Water resistant to 5 atm. 38 mm stainless steel case, 9.30 mm thick, sapphire back, 5N 18K rose gold bezel, sapphire crystal, white dial with transferred nautical flags as hour markers, 5N gold-toned hands, caliber CO 082 automatic movement with hours, minutes, seconds, and date, approximately 42 hour of power reserve, stainless steel and 5N 18K rose gold bracelet, triple-blade folding buckle. Water resistant to 50 m. (Old reference 082.200.24/V200 AA13). 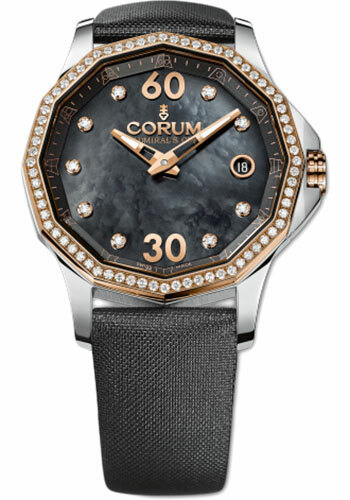 38 mm stainless steel case, 8.90 mm thick, sapphire back, 5N 18K rose gold bezel set with diamonds, sapphire crystal, white dial with transferred nautical flags as hour markers, 5N gold-toned hands, caliber CO 082 automatic movement with hours, minutes, seconds, and date, approximately 42 hour of power reserve, stainless steel and 5N 18K rose gold bracelet, triple-blade folding buckle. Water resistant to 50 m. (Old reference 082.200.29/V200 AA13).